I don’t know why I’ve put off writing this post for so long. I think secretly, I didn’t want to write it, because it would make me sad and miss New York too much! Which in all honesty, it has done exactly that. But it’s also been fun to look back at our photos and relive some of our favourite memories. For those that don’t know, my boyfriend and I spent just under a week in NYC in the middle of December. It has always been a dream of mine to visit New York near Christmas. To see the dazzling festive displays, feel the magic of this wonderful city, and live all my Home Alone dreams! But actually, as magical as all that side of the trip was, our favourite moments were those that are iconic to New York. Institutions of the city that never sleeps. And I wanted to share some of those with you today, in case you are planning a trip, or it’s on your bucket list! Pretend you’re Macaulay Culkin and visit The Plaza. We were recommended this restaurant by a colleague of my boyfriend’s, but actually when I shared this photo on my Instagram Story, it quickly became apparent that this place is POPULAR. I had so many comments telling us that we had to book a table. Luckily, we had already done so, as I have a feeling it gets booked up quickly. Basically, La Esquina is a gem! It’s top of our list, because not only does it sell exceptional Mexican food and THE best margaritas, but it was the start of a fun night in the city for us. 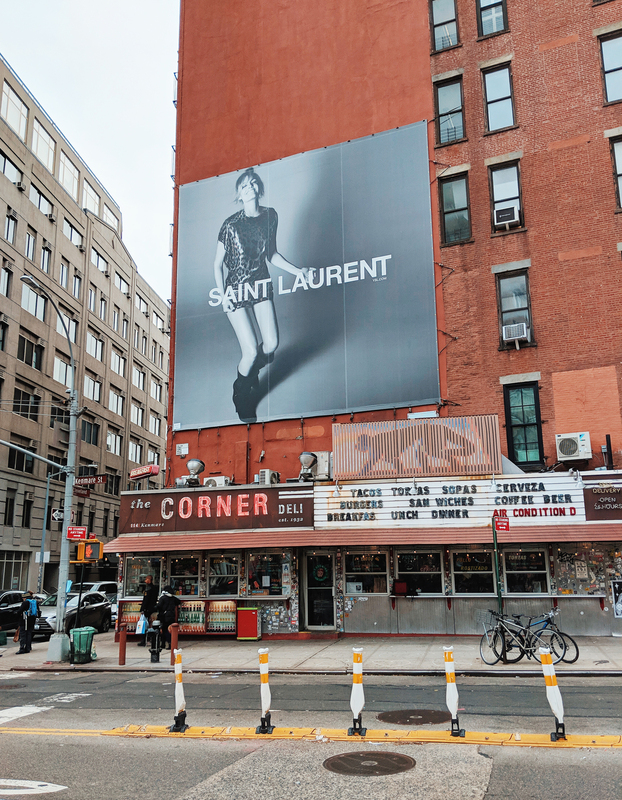 It might look like every other street corner in New York, but hidden behind that average looking door is the best food we ate during our trip. Upstairs it looks like a taco shop, dishing up Mexican food to take away. But as you enter, you’re led down a staircase, past a cloakroom, where someone else greets you and walks you straight through the kitchen! I’m talking chefs all around, dishes flying past. It was crazy! At the next turn, it all falls quiet. It’s like someone turned off the lights, and we enter a speakeasy style bar. Low lighting, velvet sofas, charming barmen, bottles upon bottles of tequila. As we grab a margarita (seriously, the best we’ve ever had! ), we start to pick up on the smells wafting in from the kitchen and spot some of the dishes come past us. It’s in that moment that we know we’re in for a special night. The restaurant itself is cosy. It’s clearly underground from the low ceilings and exposed brickwork. Tables are super close together – I had to ask the couple next to us to move to let me out. But it all just adds to the atmosphere and the fun of the place. And the food. THE FOOD. I never knew Mexican could taste so good. Honestly, we love Mexican food, but this is something else. It’s like all your favourite dishes, done perfectly, with a few fancy gems thrown in – like the ceviche (a must order) or the freshest, greenest avocado you’ve ever seen. The piece de resistance? When our waiter brings out a dish the size of my head of frijoles (insert two hand emoji). As I said, that was the start of a night to remember. The second part being a comedy night at Comedy Central. Another recommendation, this time from a colleague who was pursuing his dream of becoming a comedian. If there’s anyone that should know the best comedy night in the city, it’s him right? We bought tickets for $14 in advance, as we were also told this place sells out. They actually have a couple of venues, all in or around the same street (we went to the wrong one at first). Each venue has two showings, and they start promptly. We were told explicitly no photos or video. Phones were to be tucked away in our bags. The venue was tiny. We could tell instantly that this place was an institution. Adorning the walls were photos of previous shows. Just about every comedian you could ever think of has played there! No sooner had we ordered our first drink, than the first act got up on stage. They were okay, not great. I wasn’t sure how the rest of the night was going to go. The emcee was funny though. He has us in stitches. The second act was a little on the line with some of her jokes, and some of them were too American for us to get, but she was okay. The third act though was absolutely hilarious. He had the whole room erupting. With that we ordered a second drink, and the emcee announces the fourth act. He mentions about the phone thing again, and I think nothing of it, but little did I know that he had said it again because he was about to introduce a pretty famous comedian. In walks the one and only, Chris Rock!! He has to ask my boyfriend to move his seat so he could climb past us upon to the stage!! We couldn’t believe our luck. He’s huge! And he’s in this random comedy club on a random Wednesday night. We were on such a high when we came out, that we skipped into the bar opposite, ordered a couple more gins, and ended up waking up with a rather sore head! 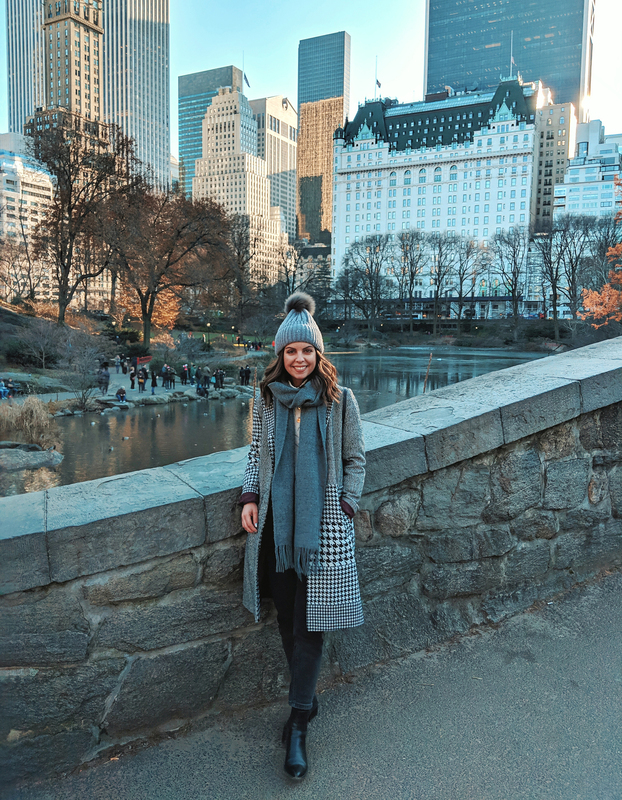 Central Park is beautiful no matter what time of year you visit. We were fortunate that it was sunny every day we were there and it was lovely to walk through the park in the cold crisp winter sun. We stopped off at a deli on route, grabbed a sandwich, and found a bench in the sun to have lunch. It was lovely to watch the world go by, heard the birds chirping all around us, and feel like we were in a movie! Central Park really has that feeling. So many classic films and iconic TV shows feature scenes shot in the park. You feel like you know it before you’ve even visited. To the east side of the park is also the Metropolitan Museum, home to the ‘Met Steps’ from Gossip Girl. We saw tens of girls taking that infamous picture, pretending to be Blair Waldorf, sitting above her minions. I know nothing about basketball, but I grew up watching Friends and listening to Joey and Chandler go on about the Knicks. I even have a Kicks sweater from Topshop, and yet I know nothing about the game. But that didn’t stop us wanted to see it for ourselves. 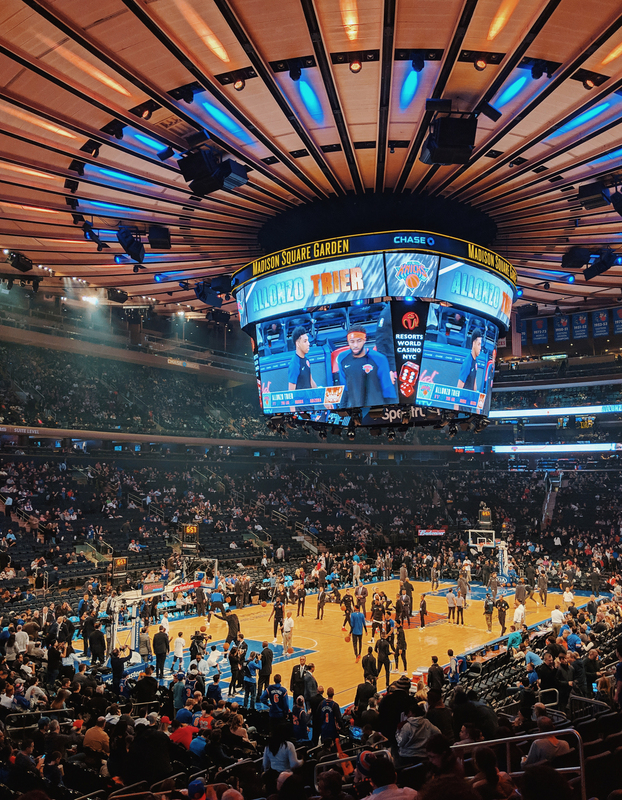 The Knicks also happen to play at the iconic Madison Square Garden. 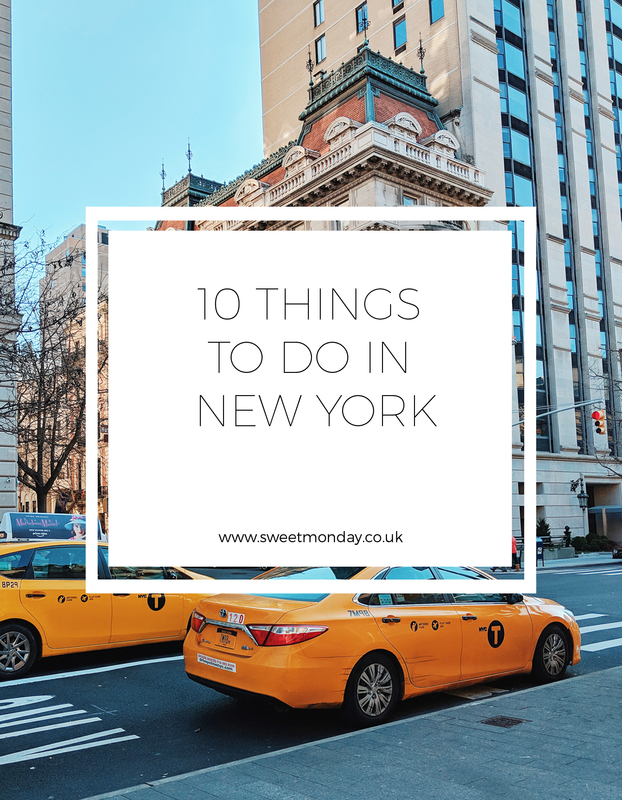 So it’s really an opportunity to tick two things off your NYC list. The night we watched them, they weren’t playing particularly great, and the Brooklyn Nets beat them. But it was fun to sit amongst their fans, drink beer, eat popcorn and spot celebs on the front row. Again, I was surprised at how many were there on a random weekday. But the screen lit up over and over, showing everyone who was there. From Nikolaj Coster-Waldau (Game of Thrones) to Pele and Alan Shearer. Just about everyone and anyone was gracing the sidelines. 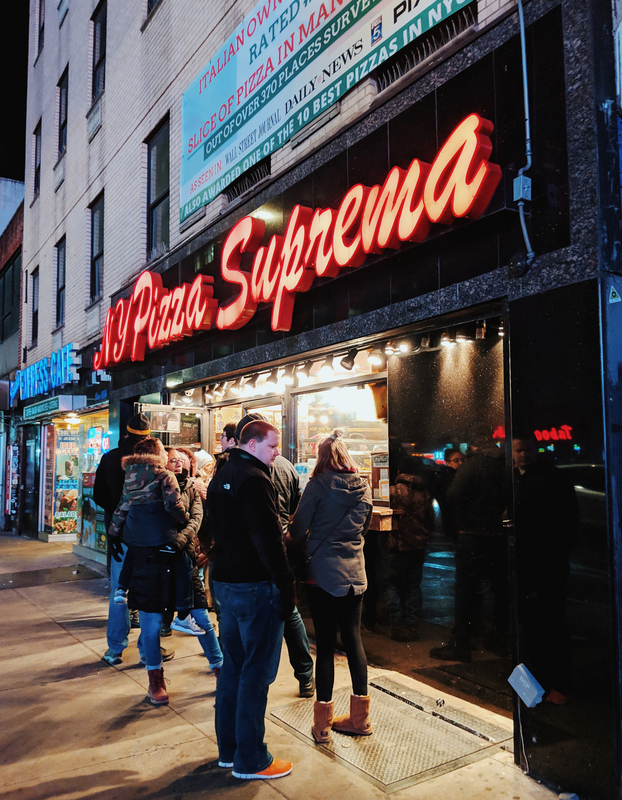 Before the game, we stopped by Pizza Suprema just across the road from the stadium for a pizza slice or two. This place kept popping up when I was searching for the best pizza in New York. These types of pizza joints, serving pizza by the slice, are on just about every street in the city. But this one had stellar reviews, and the line outside the door (in sub-zero temperatures), said it all! There were so many different pizzas to choose from, but we kept it simple with a pepperoni and their house special. They also had a variety of pizza pies, which looked next level. It’s a small place, but you can grab a table and share with others. We sat opposite two guys who were also heading to the game and had living in New York all their lives. They gave us the lowdown of basketball, the Knicks and some of their favourite spots in the city. I love that about visiting new places! Another bucket list item from me was to visit a jazz club. I’ve never been particularly into jazz, but I’d seen these type of clubs in many films, and always dreamt of going to one myself. Village Vanguard is up there with the best in the city. It’s been open for decades, and has churned out some of the most famous jazz musicians in the world. You can buy tickets to see a particular artist, or like we did, you can buy tickets to see their in-house jazz band, every Monday. Unfortunately we got there a little late. I mean, not late. We were still there 20 minutes before the scheduled start time, but clearly you have to go early to get a good spot. All the tables were taken, so we found a pew at the bar. Which was fun, but a little uncomfortable after a while. So definitely get there early! The music was great though, and the band were really good fun. I’d highly recommend! Just about everyone I know that’s been to New York, has had drinks at Refinery Rooftop. No matter the season, or the weather, this bar is pretty fun. It’s small, and difficult to get a table in winter, but they do have a small section of the outdoor rooftop with heaters. Here we were able to sip on a cocktail, and look across to the Empire State, lighting up the sky! As we visited close to Christmas, we couldn’t not swing by The Plaza and live out all our Home Alone fantasies! The Plaza was just as expected – grand, wonderfully lavish and ridiculously festive. We were going to stop for a drink, but they had a private function in the bar and the restaurant was busy sadly. However, it was still love to go inside, see their huge Christmas tree and say that we’ve been to The Plaza (kind of). 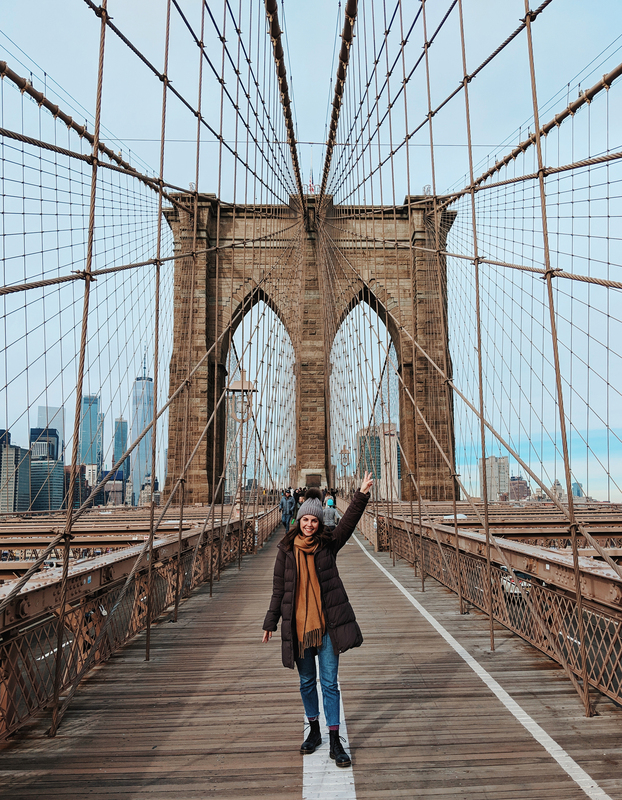 Possibly my favourite part of the trip, was two days where we found ourself in or around the West Village. On the first day we had walked the Highline, and continued to wander looking for a coffee shop to warm up in. That was our first encounter of The Village, and we immediately made plans to come back the following day to explore properly, when we had more time. 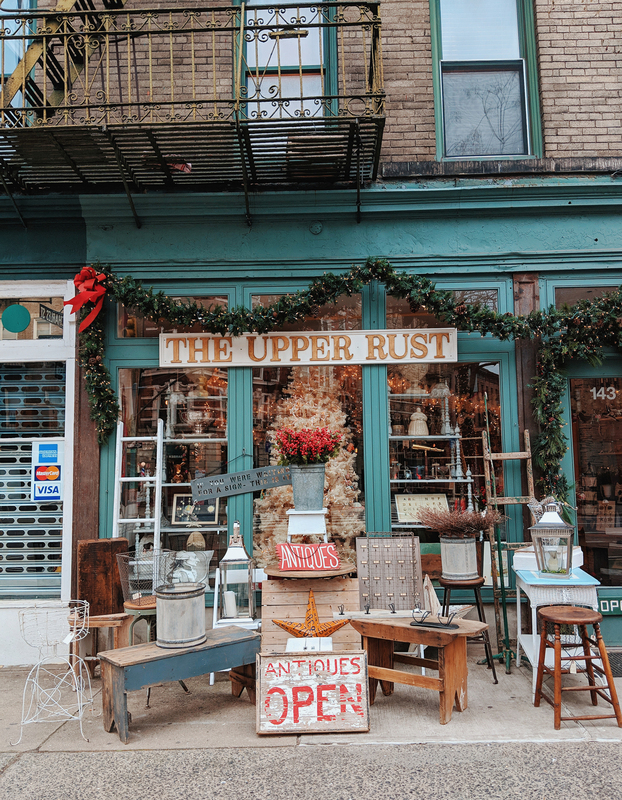 I made a small list of places in the area that I wanted to stop at – The Upper Rust (a cute antiques shop pictured above), Friends Apartment (where they filmed the outside of the apartment block they lived in) and Joe Coffee Company for an Americano. 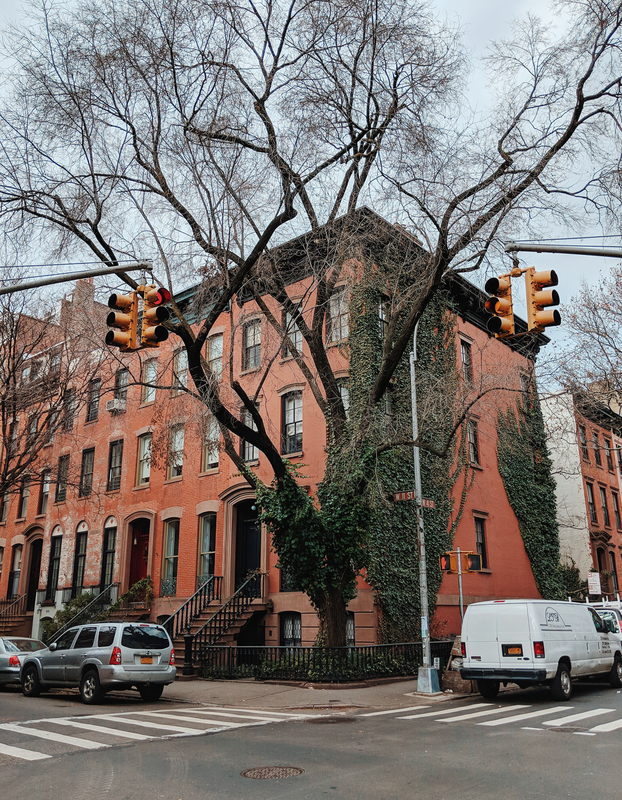 But the best thing about the West Village is simply wandering around the area, taking in the architecture, photographing all the beautiful red brick houses with huge stoops. And in December, you’ll find some of the most Christmassy decorated houses! Some streets are literally lined with decorations. It’s incredible. Also in this area is just about every brunch recommendation we recieved. Sadly we couldn’t try them all, and luckily some had restaurants in other areas, but here are some we noted down – The Butcher’s Daughter, Blue Stone Lane and Jack’s Wife Frieda. You’ll also find Village Vanguard (the jazz club I mentioned) in this area. As I mentioned, one of our mornings in New York was spent walking the length of The High Line. 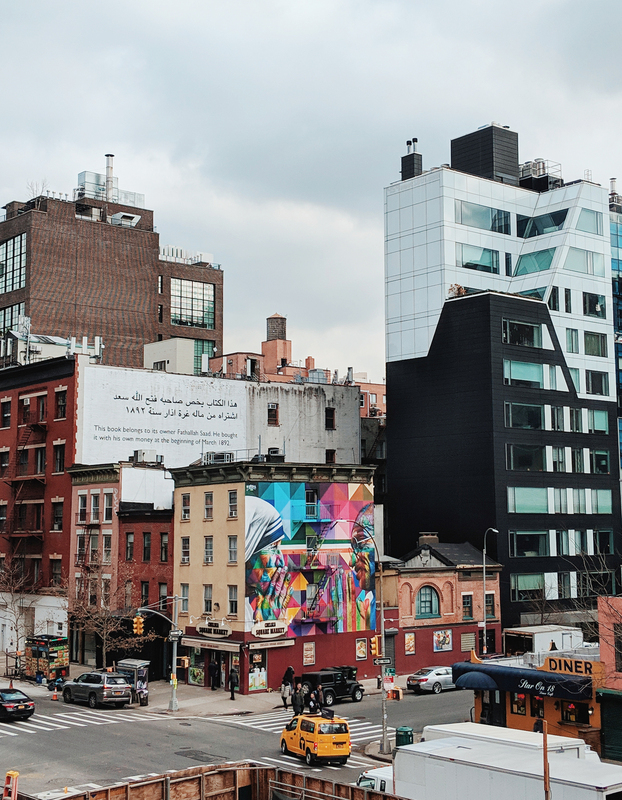 If you haven’t heard of it before, he High Line is a wonderful walk from West 34th Street, all the way down to the Whitney Museum of American Art. 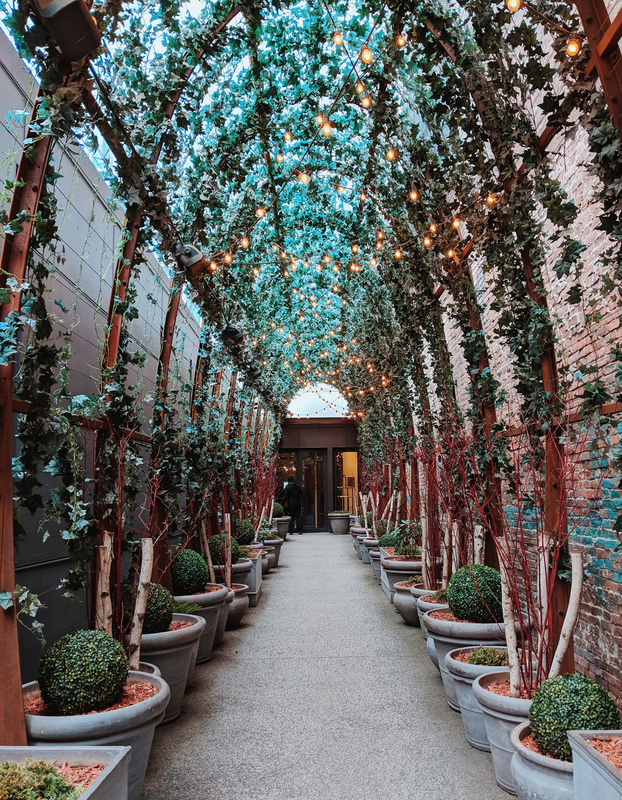 On route, you pass Chelsea Market (great for a spot of lunch) and The Standard hotel (great for a drink to finish). 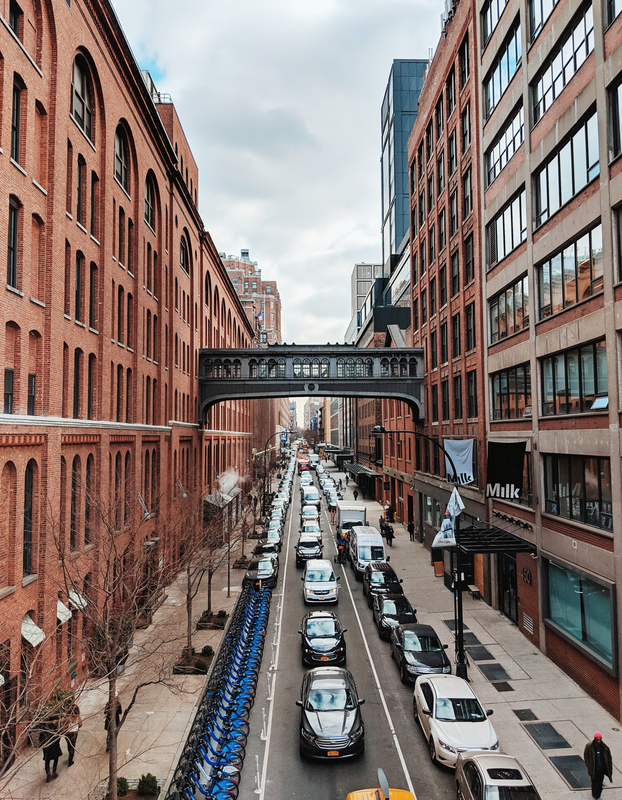 The High Line is an elevated disused railway, that is now home to hundreds of plants, benches overlooking the city, and interesting facts to read along the way. It’s about a mile and a half in length, and is a lovely way to escape the hustle and bustle of the city. 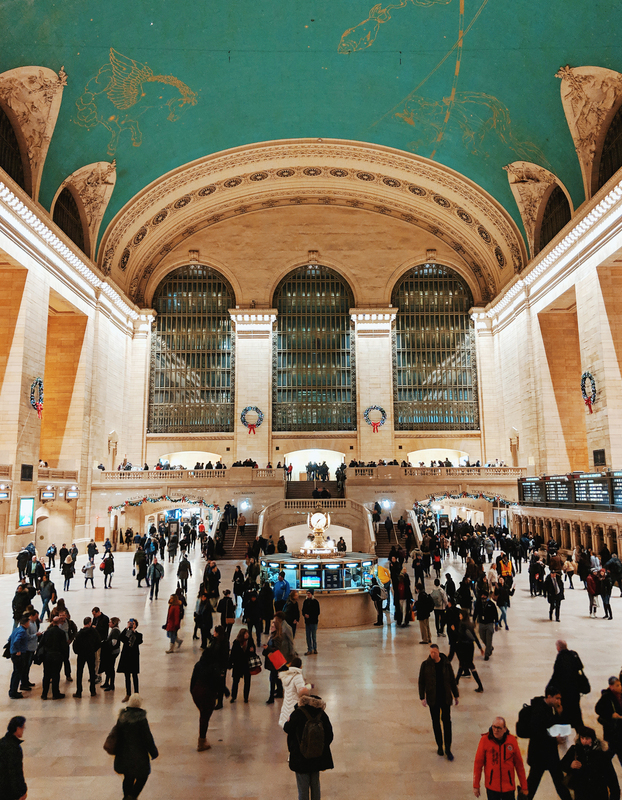 I haven’t included this one, but Grand Central Station is also a must see! The building itself is absolutely stunning, with a beautiful turquoise ceiling, grand staircases and old style ticket booths. Plus you can live another of your Gossip Girl dreams and pretend you’re Serena Vanderwoodsen. I hope you enjoyed reading this as much as I enjoyed writing it. 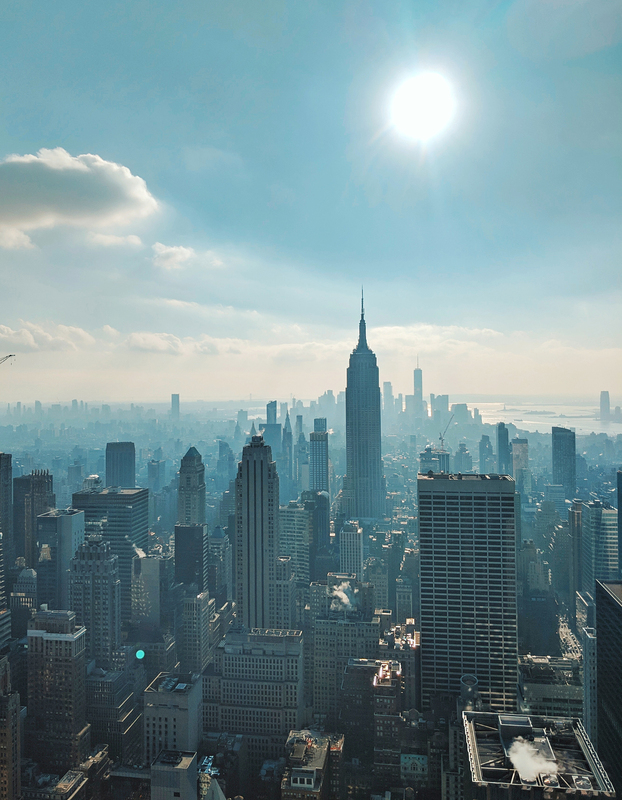 If you’re planning a trip to New York, please let me know, and I’d be happy to share more recommendations, including food and drink spots, cultural areas of interest and hotels to stay at. 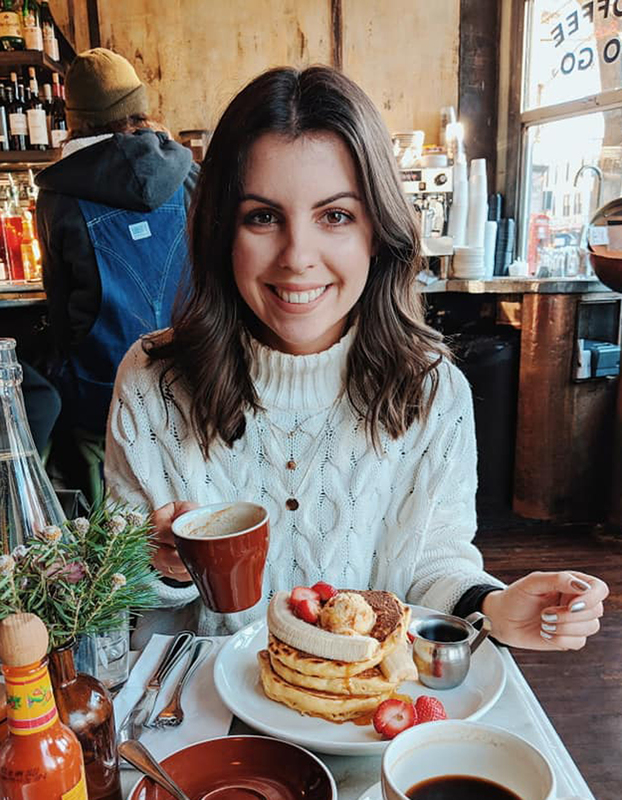 I’ll also be sharing my top brunch spots in the city and everything you need to see if you plan to go for Christmas! Stay tuned. 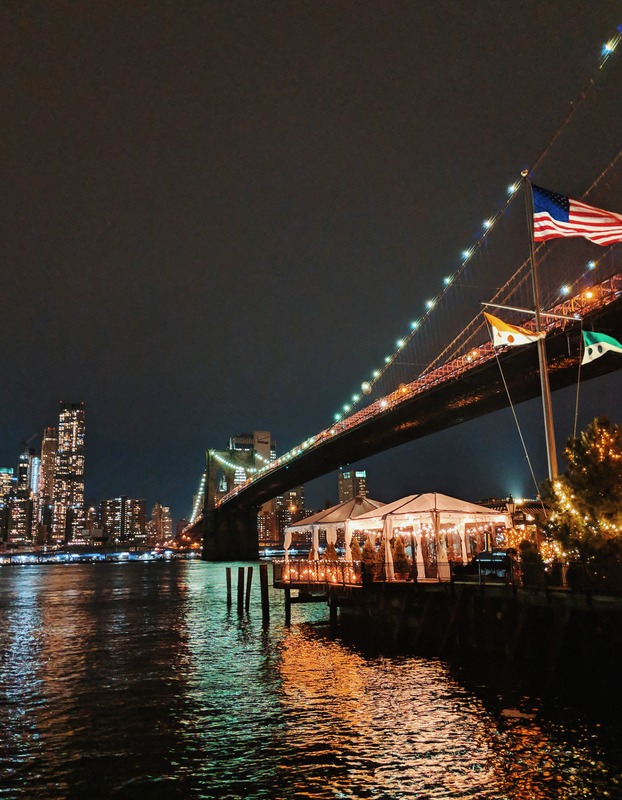 Be sure to checkout Expedia for some great flight/holiday deals to New York too. We found a lot of hotels to choose from on there.